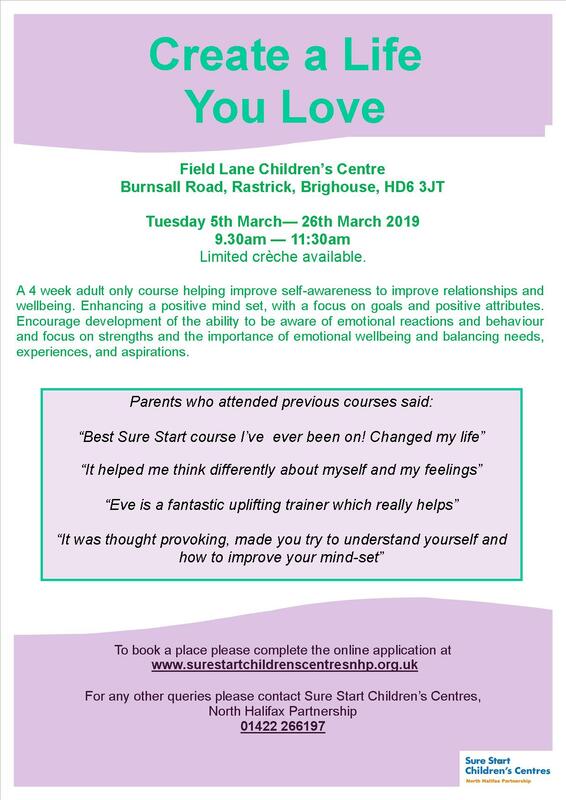 This is a 4 week adult only course starting on Tuesday 5 March, 9:30am-11:30am at Field Lane Children’s Centre, Burnsall Road, Rastrick, Brighouse HD6 3JT helping to improve self-awareness to improve relationships and wellbeing. Enhancing a positive mindset with a focus on goals and positive attributes. Encourage development of the ability to be aware of emotional reactions and behaviour and focus on strengths and the importance of emotional wellbeing and balancing needs, experiences and aspirations. For further information call 01422 266197. This entry was posted in Events, Mar, Rastrick, Sure Start and tagged Field Lane Children’s Centre, NHP Sure Start Children's Centres.